TurboWire is currently one of the strongest p2p clients built. Think at Limewire with an attitude. TurboWire is a multi-platform Gnutella client, very resourceful when it comes to various features such as auto-connect, groups, browse host, multiple search, upload throttling, connection quality control, library management and efficient filtering. 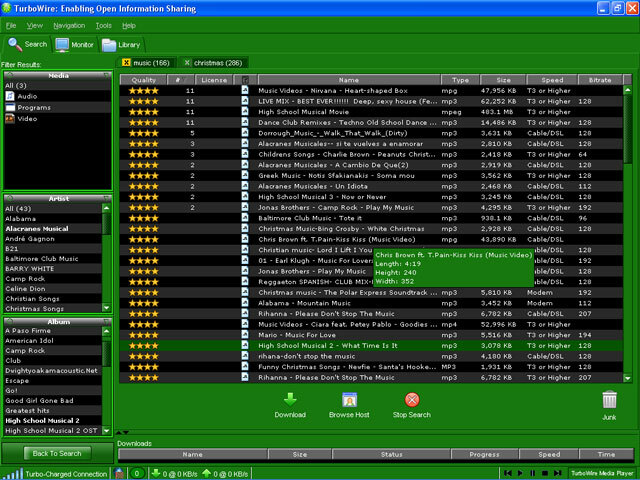 TurboWire is a Gnutella popular file sharing program. ...... and efficient filtering. This software was designed for both beginners and savvy users. It is written in Java which means it supports Windows, Mac and Linux. TurboWire's interface is very stylish and at the same time extremely easy to use. Everything you demand from a P2P Gnutella client is right here and using Turbowire will connect you to one of the largest user communities out there and a gigantic data base for files. Qweas is providing links to TurboWire 2.6.0 as a courtesy, and makes no representations regarding TurboWire or any other applications or any information related thereto. Any questions, complaints or claims regarding this application TurboWire 2.6.0 must be directed to the appropriate software vendor. You may click the publisher link of TurboWire on the top of this page to get more details about the vendor.